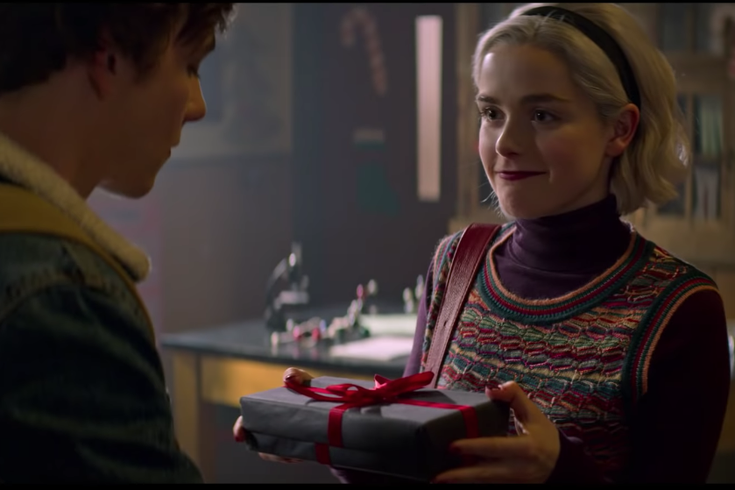 Netflix is releasing a "Chilling Adventures of Sabrina" holiday special, "A Midwinter's Tale," on Dec. 14. Remember when we reported earlier that Netflix is giving us more "Chilling Adventures of Sabrina," and we could not be more excited? Well, our cup is running over. The trailer for the upcoming holiday special dropped late Tuesday night - that's right, Sabrina is getting her own spooktacular Christmas special - after the streaming service released the Season 2 trailer on Monday. Praise Satan! The first trailer is set to "Cherry Bomb" by The Runaways, which is quite fitting for an enticing Sabrina who seems very in tune with her new powers since signing her soul to the Book of the Dead at the end of Season 1. While "Chilling Adventures" is pretty far removed from the popular, cutesy '90s sitcom, "Sabrina, the Teenage Witch" - you know with its worshipping the Dark Lord and such - there is one similarity between the two in this trailer. Sabrina whips herself around to change outfits, just like Melissa Joan Hart's Sabrina would do in the opening credits to the TGIF show. We see a confident Sabrina getting rather cozy with warlock, Nick Scratch, on the dance floor, with some sort of weird pentagram slash maypole thing happening in the scene. Sabrina is briefly seen returning to Baxter High, talking with Susie as a janitor mops with blood. The teen witch gets a bit frisky with her high school sweetheart, Harvey - and Nick. (Busy girl.) We also see the glimmer of a more adventurous Hilda, along with remnants of spells, more blood, and the Dark Lord encouraging Sabrina to "do it" in the last shot of the trailer - whatever that means. The latest trailer promotes the holiday special, "A Midwinter's Tale," out Dec. 14. The special celebrates the Winter Solstice, like all good witches should, and journeys back in time to delve into Sabrina Spellman's childhood.